Hello fellow bloggers. I hope you had a lovely weekend. I managed to craft most of Saturday and I loved it! 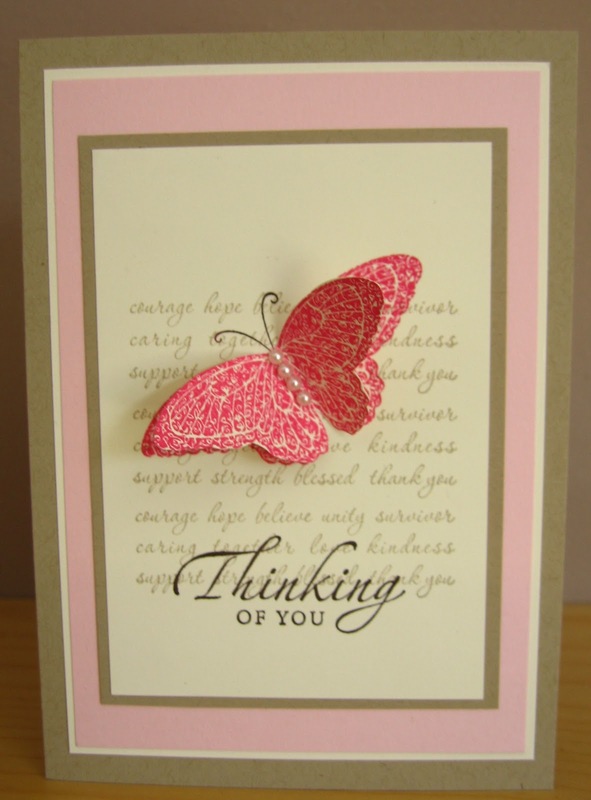 This is one of those stunning but simple cards, and I adore the way it has turned out. I have been seeing this stamp set on many blogs and they all look great. Stampin' Up will donate £1 for every stamp set sold to the Breast Cancer Research Fund, and I own three sets!!! So it really is a great cause and you can make so many variations using the stamps, so go on, treat yourself to it - you won't regret it. Cardstock - Crumb Cake, Whisper White and Pink Pirouette. Ink - Melon Mambo, Crumb Cake and Early Espresso. Stamp Set - Strength & Hope. If you like this or any of my other cards and want to make it, I'd love to come to you and hold a workshop from the comfort of your own home... You'd have the opportunity to get a free stamp set and free products from both current catalogues. All you have to do is invite your friends, and they could get to make this card or a different free project and also buy Stampin' Up's wonderful products..... sounds great doesn't it... so contact me for more information today! Have a good week and pop back again soon to see more cards. I love how the card turned out too..